Product attributes and features can be assigned for new products on your Thelia website. However, to achieve that, you first need to create a product template and add the attributes and features that you wish to it. The new product template can be assigned for any product on your website after that. A product template is a way to combine different attributes and features together. Using the template, you can then assign them to a certain product on your website. In order to create attributes and features of your choice, you can review our tutorials on how to create Product Attributes and Product Features. To create a new product template, you need to access the administrative area of your website and then navigate to the Configuration tab from the main menu. Locate the Product Catalog Configuration section and click on the Product Templates. Click on the plus-sign button at the top-right corner of the screen to create a new product template. Enter the name of the new product template and click on the Create this product template button to keep it. 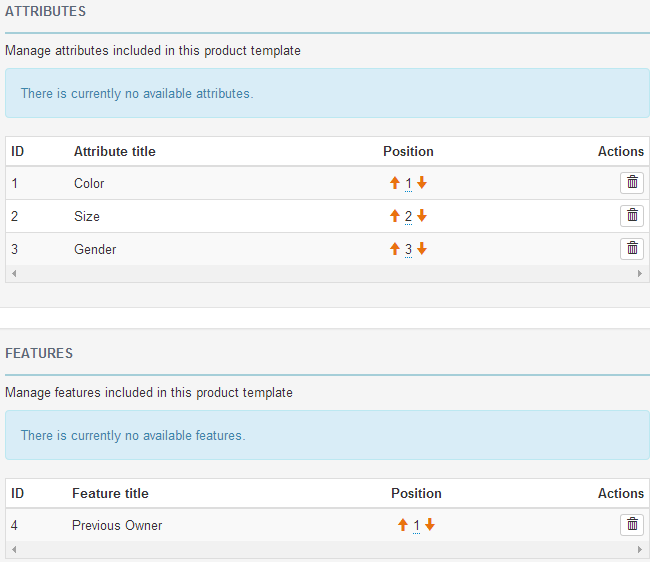 Attributes: Choose and add the product attributes that you wish to assign to the new product template. Features: Choose and add the product features that you wish to assign to the new product template. Click on the Save or Save and close button to keep the changes on the new product template. To edit a template, you need to access the Product Template section on your website again. You will notice a list of all the product templates on your website. Click on the Edit action button next to the one that you wish to edit. Make the changes on your template and click on the Save or Save and close button to keep the changes. To remove a template from your website, access the admin area of your website again and navigate to the Configuration area. Click on Product Templates again and then the delete action button next to the one that you wish to remove.